After potentially losing the top spot in feature phone sales to Reliance Jio in Q4 2017, Samsung has some bad news on the smartphone front as well. According to the latest data from market research firm Canalys, Xiaomi beat Samsung to emerge as the top smartphone vendor in India this part quarter. Canalys says Xiaomi shipped close to 8.2 million units compared to Samsung’s 7.3 million smartphone shipments in Q4 2017. Xiaomi’s market share for the quarter stood at 27%, while Samsung came in second place at 25%. Together, they accounted for more than 50% of the smartphone market share in India for Q4 2017. Samsung registered an annual growth of 17%, but that was not enough to retain the top spot in the Indian market. Samsung was followed by Vivo, Oppo, and Lenovo for the next three spots. It is worth pointing that smartphone shipment reports from market research firms are not always accurate and are typically based on incomplete and unofficial sources of data. In fact, reports from different firms often publish contradictory findings. However, it is not impossible that Xiaomi took over the top position from Samsung in India, given that there were visible signs of it last year. Many market research firms were pointing to Xiaomi’s changing fortunes in India. In October, data from Counterpoint Research showed that while Samsung maintained its lead in Q3 2017, Xiaomi was at a striking distance to take over the top position. This was followed by Q3 2017 data from IDC which showed that both Samsung and Xiaomi were both tied at 23.5% market share. 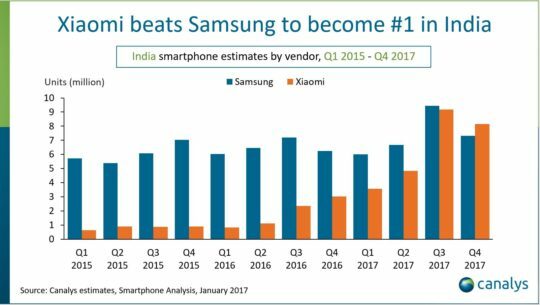 An interesting factor to note in all these reports is that sales of Samsung smartphones are not declining in India, but instead Xiaomi is growing at a much faster rate than Samsung. The smartphone market in India is still growing and Xiaomi is taking a much larger pie of the growing market. The fact that Samsung reported a 27% increase in mobile revenues in India amidst all this noise of Xiaomi beating Samsung speaks volumes about the nature of expanding smartphone market in India. Samsung’s weak point in India seems to be its mid-range and budget devices. None of them matches Xiaomi’s value for money offerings. There has been a lot of talk about Samsung revamping its strategy in India to counter Xiaomi. However, the efforts and the results so far are nothing substantial. It will be interesting to see how Samsung responds to Xiaomi’s onslaught in 2018. Chinese copycats can’t provide innovation to customers. They are gaining ground because of providing cheap quality at low price range.Remember Micromax. These Chinese companies would met with same fate. U can’t compare a donkey with a horse(samsung). Which chinese smartphone is comparable to Samsung’s S and note series? The answer is ‘nothing’. Samsung is a king of innovative mobile technology. No one can beat it. So, learn to respect quality and innovation. Don’t appreciate cheap quality. I am smiling…it was evident.What to expect from a company which doesnot provide some basic sensors at the price of ₹12000.Samsung thought that people will purchase their device based on Samsung branding.Sorry,Samsung those days have gone.Think for the future.Launch excellent budget device. do indians care about updates? i know western consumers don´t care that much or even don´t know which version they have.